Bariatric Embolization: Are Patients Actually Losing Weight? An overview of what we currently know about weight loss expectations associated with bariatric embolization. Figure 1. Estimated weight loss (EWL) for various bariatric procedures. Currently, there are many surgical options for weight loss. Each option provides a different range of expected weight loss but also comes with increasing risks for complications. Images https://magenverkleinerung.tips and © 2016 DBCLS TogoTV. Figure 2. Hormone cycle during fasting and fed states. Ghrelin is secreted by X/A-like cells in the fundus of the stomach during a fasting state, initiating the hunger drive. 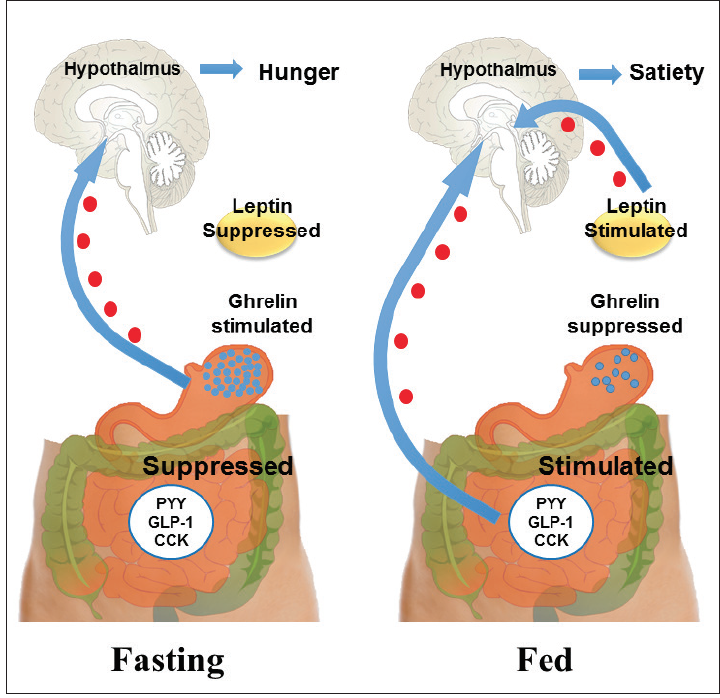 After feeding, leptin is secreted from adipose tissue, suppressing hunger. CCK, cholecystokinin; GLP-1, glucagon-like peptide-1; PYY, peptide tyrosine tyrosine. Adapted from Häggström M (2014). Medical gallery of Mikael Häggström 2014. WikiJournal of Medicine. 2014;1(2):8. doi:10.15347/ wjm/2014.008. ISSN 2002-4436. An interesting effect seen in bariatric surgery, which may play a significant role in weight reduction, is the change in hormone profile that occurs. One of the hormones that is affected by bariatric surgery is ghrelin, a 28-amino acid peptide that is largely responsible for initiating appetite (orexigenic). In a normal patient, ghrelin significantly increases before meals and rapidly decreases after a meal has been consumed (Figure 2). In obese patients, ghrelin often fails to decrease after a meal.23 About 90% of ghrelin is produced from cells in the fundus of the stomach.24 Bariatric surgery has been shown to reduce ghrelin for sustained periods of time. Focusing on the metabolic effect of bariatric surgery, bariatric embolization for obesity is currently being explored, with the goal of inducing weight loss through a reduction of ghrelin via transarterial embolization of the gastric fundus via the left gastric artery (LGA) and, to some extent, the gastroepiploic artery (GEA). The procedure causes ischemia in the gastric fundus, which appears to decrease ghrelin production from the hormonally active X/A-like cells, resulting in appetite suppression/early satiety and weight loss (Figure 3 and Figure 4). Due to the rich collateral supply to the stomach, bariatric embolization appears to be well tolerated. Figure 3. Pre-embolization selection on a left gastric arteriogram. Left gastric arterial branches cover a large part of the fundus of the stomach. Vasospasm was present in the proximal portion. Figure 4. Postembolization selection on a left gastric arteriogram. Distal branches show clear embolization, while the main branch continues to show some filling, ensuring future collateralization. In 2015, Kipshidze et al conducted the first prospective study and performed bariatric embolization on five Eastern European patients (mean BMI, 42.2 ± 6.8 kg/m2) using a 300–500-µm Bead Block particles (BTG International). The authors demonstrated that bariatric embolization was a safe procedure with no periprocedural complications or alterations to the stomach mucosa.34 In addition, all five patients reported reduced appetite and a mean weight change of 45.2 lb (17.2%) after 24 months. Plasma ghrelin levels decreased by 24% at 3-month follow-up and remained lower than baseline at 12-month follow-up. Although this early study showed very promising results, it was not a US Food and Drug Administration (FDA)–approved study, and details about the published protocol are scant. To date, in addition to the study by Kipshidze et al, there are three ongoing clinical trials focused on bariatric embolization, all of which have reported and published their preliminary results (Table 1).34-37 The first trial, GET LEAN, is an FDA-approved, single-arm pilot study of four morbidly obese patients (mean BMI, 42.4 ± 2.6 kg/m2).35 The LGA was embolized using 300–500-μm Bead Block particles. Complete cessation of flow (ie, stasis) of the LGA and its branches was the endpoint of the bariatric embolization procedure, with stasis defined as visualization of contrast medium within the main LGA for at least five cardiac cycles. There were no major adverse events or major complications. Three minor adverse events, including superficial gastric ulcerations, nausea, and vomiting, were observed in three patients. These three patients required only nominal therapy without hospitalization, and all adverse events resolved by 30 days. Mean body weight loss among the four patients at 6 months postprocedure was 20.3 ± 24.34 lb (8.5% reduction in total weight or 17.2% of excess body weight). Among the four included patients, the first patient had a weight loss of 48 lb at 1 year, representing 49% of excess body weight. One patient had type 2 diabetes and had a weight loss of 20.3 lb at 6 months in addition to a reduction of the glycated hemoglobin (HbA1c) level from 7.4% preprocedure to 6.3% at 3 months postprocedure, remaining at this level at 6 months. Plasma ghrelin levels decreased in two patients and increased in another two patients at 6 months, with an average increase from 612 pg/mL at baseline to 645 pg/mL at 6 months. Plasma leptin levels exhibited a decrease overall, except in one patient who lost the least amount of weight, which is logical, given that leptin is produced by adipose cells. BEAT Obesity is an FDA-approved, single-arm, multicenter pilot study, which will include 20 patients with a BMI between 40 and 60 kg/m2 and body weight < 400 lb.36 According to the preliminary report, five nondiabetic, obese patients with a mean BMI of 43.8 ± 2.9 kg/m2 have been enrolled. Embolization of the LGA, as well as the distal GEA (if deemed necessary), was performed with 300–500-μm Embosphere microspheres (Merit Medical Systems, Inc.). There were no major adverse events at 3-month follow-up. One patient acquired transient subclinical pancreatitis that had resolved by the 1-week follow-up visit. Another patient developed a small asymptomatic superficial ulcer in the fundus that was observed at the 2-week follow-up endoscopy, which had resolved by the time of the 3-month follow-up endoscopy. At 1 and 3 months, the reported average excess body weight loss was 13.0 ± 5.3 lb (9.1%) and 19.8 ± 9.0 lb (13.9%), respectively, among four patients. Serum ghrelin increased 8.7% at 1 month from a mean baseline value of 894.8 ± 251.1 pg/mL but decreased 17.5% from baseline at 3 months. The final results of the study will include the 1-year follow-up data of 20 patients from the Johns Hopkins Hospital in Baltimore, Maryland, and the Mount Sinai Hospital in New York, New York. The most recent ongoing trial with published preliminary data is the Chinese trial being undertaken by Bai et al.37 The trial aims to include 50 patients, and the published preliminary study included five patients with a BMI ≥ 30 kg/m2. Patients underwent bariatric embolization of selected superior branches of the LGA using 500–710-μm polyvinyl alcohol particles (Cook Medical), avoiding nontarget embolization of the body of the stomach as much as possible. In this study, there were no major adverse events reported during the 9-month follow-up period. One patient developed a superficial linear ulceration below the cardia, which was noted at the 3-day follow-up endoscopy and had resolved by the 30-day follow-up endoscopy. Patients demonstrated an average weight loss at 3, 6, and 9 months of 18.25 ± 16.09 lb (7.58%), 22.97 ± 18.10 lb (9.79%), and 28.44 ± 32.32 lb (12.64%), respectively. Ghrelin levels decreased by 40.83%, 31.94%, and 24.82% at 3, 6, and 9 months after the procedure, respectively, from a baseline of 310.4 ± 95.79 pg/mL. In addition, postprocedure MRI demonstrated that subcutaneous adipose tissue significantly decreased during the follow-up period. Preliminary data from these pilot trials demonstrate that weight loss appears to be achievable in the short- to medium-term with bariatric embolization. The weight loss in these trials appears to correlate with a decrease in serum ghrelin, but neither the degree of weight loss nor the correlation with serum ghrelin has yet been definitively proven. When considering patients from the aforementioned studies,34-37 one might expect an 8% to 10% total weight loss over a 6- to 12-month period on average. 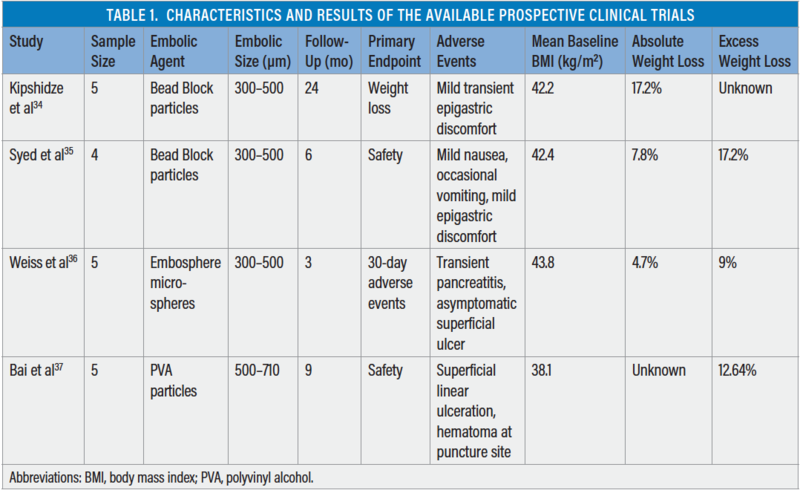 It also appears that bariatric embolization is well tolerated; pain, nausea, vomiting (all limited to ~48 hours), and superficial gastric ulcerations (healed by 1–3 months) were the most common postprocedural occurrences. Although these results are promising, there are several open questions regarding the efficacy of bariatric embolization. Who Is the Ideal Candidate for Bariatric Embolization? Patients in the GET LEAN and BEAT Obesity trials had a BMI ≥ 40 kg/m2; however, patients with a BMI ≥ 30 kg/m2 were included in the latest Chinese trial. Although the difference in BMI can be attributed to cultural differences, all three trials demonstrated a similar range of weight loss. These data suggest that bariatric embolization may be more effective in treating patients with varying levels of obesity (ie, overweight vs obese vs morbidly obese), but this needs to be studied further. Does Bariatric Embolization Have an Effect on Diabetes, and Is It Independent of Weight Loss? A clinically significant effect was seen in the single diabetic patient included in the GET LEAN trial, and while no diabetic patients were included the BEAT Obesity trial, a reduction in HbA1c was observed. This question will likely be answered as future trials expand to include diabetic patients. What Is the Long-Term Efficacy of Bariatric Embolization? Because previous animal studies have shown that weight and ghrelin levels eventually trend toward the baseline after bariatric embolization, it is important to identify the long-term treatment effects of bariatric embolization.25-28,31 Of note, the animals in many of these experiments were growing juveniles, unlike the adult patients studied in all human trials to date. However, it has been suggested that the reversal or slowing of the procedural effect is due to revascularization of the stomach.26,31 If these results are reflected in current ongoing clinical trials (ie, if the treatment effect tapers off at 6 to 12 months or if the patients experience rebound weight gain), it will help to define the role of bariatric embolization for the treatment of obese patients. 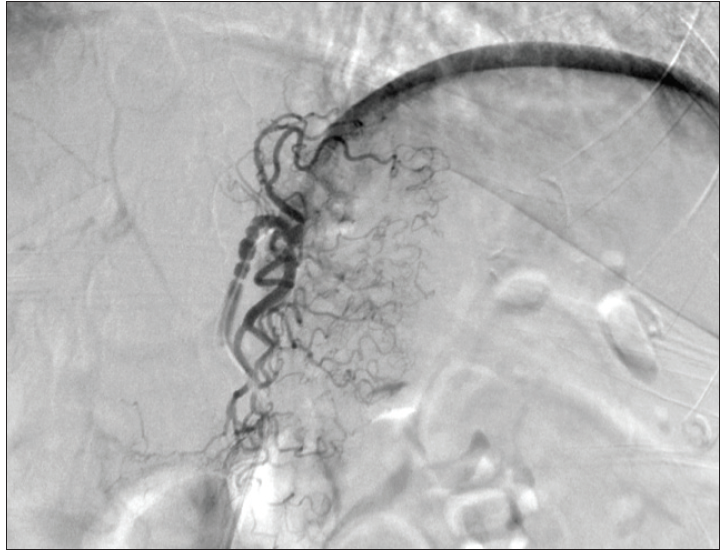 If the treatment effect is shown to be transient only, then questions regarding repeat embolization or whether the procedure should be supplemented with other treatments, such as banding, may need to be explored. Combining bariatric embolization with ongoing dieting and pharmacology may play a larger role in the maintenance of weight loss. What Is the Best Way to Perform Bariatric Embolization? Clearly, the specific technique of bariatric embolization has not been standardized with regard to the ideal embolic agent (ie, composition and size), the exact blood vessels that should be embolized, or the embolization endpoint. Several different embolic agents of various sizes were used both in preclinical and clinical studies. To date, the LGA is the most common main target for embolization. However, the GET LEAN trial involved embolization of all the distal branches of the LGA, and Bai et al performed selective embolization of the cranial-most branches of the LGA. In BEAT Obesity, the embolization target was “fundal arteries,” which included LGA branches, as well as the distal GEA, if it was considered a significant source of fundal perfusion. Embolization endpoints also differed among the trials, with varying definitions of observed stasis or lack of perfusion through the main LGA or its branches. What Is the Mechanism of Action of Bariatric Embolization? It is believed that transient ischemia leads to decreased ghrelin production in the gastric fundus, but this may merely be a correlative, not a causative fact. It is likely that other factors play a role. One possible contribution may come from decreased gastric motility that results from partial stomach fibrosis. Other hormonal changes may exert a larger effect on appetite and satiety than were initially appreciated. In addition, the effects of bariatric embolization may be primarily due to patient education or psychological factors. The early preliminary pilot data on bariatric embolization show a promising and fairly consistent weight loss for at least 6 months. Longer-term results will be very important in helping to determine the long-term effects of bariatric embolization on weight loss, if any. Clearly, this is an exciting and active area of research, and more well-designed clinical trials are needed. 1. Au N, Johnston DW. Too much of a good thing? Exploring the impact of wealth on weight. Health Econ. 2015;24:1403-1421. 2. Mokdad AH, Ford ES, Bowman BA, et al. Prevalence of obesity, diabetes, and obesity-related health risk factors, 2001. JAMA. 2003;289:76-79. 3. Bays HE, Toth PP, Kris-Etherton PM, et al. Obesity, adiposity, and dyslipidemia: a consensus statement from the National Lipid Association. J Clin Lipidol. 2013;7:304-383. 4. Ogden CL, Carroll MD, Kit BK, et al. Prevalence of childhood and adult obesity in the United States, 2011–2012. JAMA. 2014;311:806-814. 5. Sturm R, Hattori A. Morbid obesity rates continue to rise rapidly in the United States. Int J Obes (Lond). 2013;37:889-891. 6. Finucane MM, Stevens GA, Cowan MJ, et al. National, regional, and global trends in body-mass index since 1980: systematic analysis of health examination surveys and epidemiological studies with 960 country-years and 9.1 million participants. Lancet. 2011;377:557-567. 7. Cawley J, Meyerhoefer C. The medical care costs of obesity: an instrumental variables approach. J Health Econ. 2012;31:219-230. 8. Jones LR, Wilson CI, Wadden TA. Lifestyle modification in the treatment of obesity: an educational challenge and opportunity. Clin Pharmacol Ther. 2007;81:776-779. 9. Lowe MR. Self-regulation of energy intake in the prevention and treatment of obesity: is it feasible? Obes Res. 2003;11 suppl:44S-59S. 10. DeMaria EJ. Bariatric surgery for morbid obesity. N Engl J Med. 2007;356:2176-2183. 11. Jung Y. Role of endoscopic gastroplasty techniques in the management of obesity. Clin Endosc. 2017;50:21-25. 12. Vix M, Liu KH, Diana M, et al. Impact of Roux-en-Y gastric bypass versus sleeve gastrectomy on vitamin D metabolism: short-term results from a prospective randomized clinical trial. Surg Endosc. 2014;28:821-826. 13. Clinical guidelines on the identification, evaluation, and treatment of overweight and obesity in adults—the evidence report. National Institutes of Health. Obes Res. 1998;6 suppl 2:51S-209S. 14. Montesi L, El Ghoch M, Brodosi L, et al. Long-term weight loss maintenance for obesity: a multidisciplinary approach. Diabetes Metab Syndr Obes. 2016;9:37-46. 15. Wadden TA, Butryn ML, Byrne KJ. Efficacy of lifestyle modification for long-term weight control. Obes Res. 2004;12 suppl:151S-162S. 16. Maahs D, de Serna DG, Kolotkin RL, et al. Randomized, double-blind, placebo-controlled trial of orlistat for weight loss in adolescents. Endocr Pract. 2006;12:18-28. 17. Smith SR, Weissman NJ, Anderson CM, et al. Multicenter, placebo-controlled trial of lorcaserin for weight management. N Engl J Med. 2010;363:245-256. 18. Gadde KM, Allison DB, Ryan DH, et al. Effects of low-dose, controlled-release, phentermine plus topiramate combination on weight and associated comorbidities in overweight and obese adults (CONQUER): a randomised, placebo-controlled, phase 3 trial. Lancet. 2011;377:1341-1352. 19. NIH conference. Gastrointestinal surgery for severe obesity. Consensus Development Conference Panel. Ann Intern Med. 1991;115:956-961. 20. Ballantyne GH. Measuring outcomes following bariatric surgery: weight loss parameters, improvement in co-morbid conditions, change in quality of life and patient satisfaction. Obes Surg. 2003;13:954-964. 21. Buchwald H, Avidor Y, Braunwald E, et al. Bariatric surgery: a systematic review and meta-analysis. JAMA. 2004;292:1724-1737. 22. Schauer PR, Bhatt DL, Kirwan JP, et al. Bariatric surgery versus intensive medical therapy for diabetes—3-year outcomes. N Engl J Med. 2014;370:2002-2013. 23. English PJ, Ghatei MA, Malik IA, et al. Food fails to suppress ghrelin levels in obese humans. J Clin Endocrinol Metab. 2002;87:2984. 24. Wren AM, Bloom SR. Gut hormones and appetite control. Gastroenterology. 2007;132:2116-2130. 25. Arepally A, Barnett BP, Montgomery E, Patel TH. Catheter-directed gastric artery chemical embolization for modulation of systemic ghrelin levels in a porcine model: initial experience. Radiology. 2007;244:138-143. 26. Arepally A, Barnett BP, Patel TH, et al. Catheter-directed gastric artery chemical embolization suppresses systemic ghrelin levels in porcine model. Radiology. 2008;249:127-133. 27. Bawudun D, Xing Y, Liu WY, et al. Ghrelin suppression and fat loss after left gastric artery embolization in canine model. Cardiovasc Intervent Radiol. 2012;35:1460-1466. 28. Paxton BE, Kim CY, Alley CL, et al. Bariatric embolization for suppression of the hunger hormone ghrelin in a porcine model. Radiology. 2013;266:471-479. 29. Paxton BE, Alley CL, Crow JH, et al. Histopathologic and immunohistochemical sequelae of bariatric embolization in a porcine model. J Vasc Interv Radiol. 2014;25:455-461. 30. Paxton BE, Arepally A, Alley CL, et al. Bariatric embolization: pilot study on the impact of gastroprotective agents and arterial distribution on ulceration risk and efficacy in a porcine model. J Vasc Interv Radiol. 2016;27:1923-1928. 31. Kim JM, Kim MD, Han K, et al. Bariatric arterial embolization with non-spherical polyvinyl alcohol particles for ghrelin suppression in a swine model. Cardiovasc Intervent Radiol. 2017;40:744-749. 32. Gunn AJ, Oklu R. A preliminary observation of weight loss following left gastric artery embolization in humans. J Obes. 2014;2014:185349. 33. Anton K, Rahman T, Bhanushali A, et al. Weight loss following left gastric artery embolization in a human population without malignancy: a retrospective review. J Obes Weight Loss Ther. 2015;5. 34. Kipshidze N, Archvadze A, Bertog S, et al. 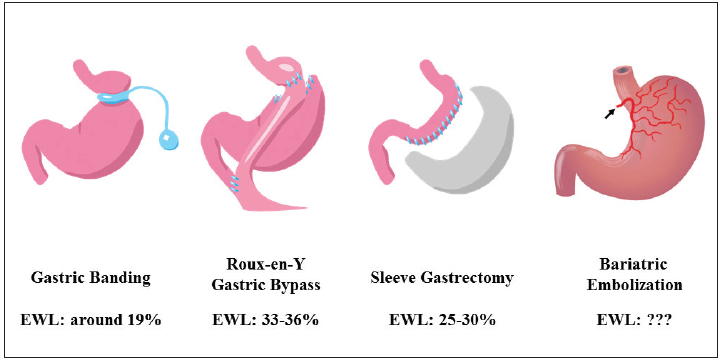 Endovascular bariatrics: first in humans study of gastric artery embolization for weight loss. JACC Cardiovasc Interv. 2015;8:1641-1644. 35. Syed MI, Morar K, Shaikh A, et al. Gastric artery embolization trial for the lessening of appetite nonsurgically (GET LEAN): six-month preliminary data. J Vasc Interv Radiol. 2016;27:1502-1508. 36. Weiss CR, Akinwande O, Paudel K, et al. Clinical safety of bariatric arterial embolization: preliminary results of the BEAT Obesity trial. Radiology. 2017;283:598-608. 37. Bai ZB, Qin YL, Deng G, et al. Bariatric embolization of the left gastric arteries for the treatment of obesity: 9-month data in 5 patients [published online October 23, 2017]. Obes Surg. 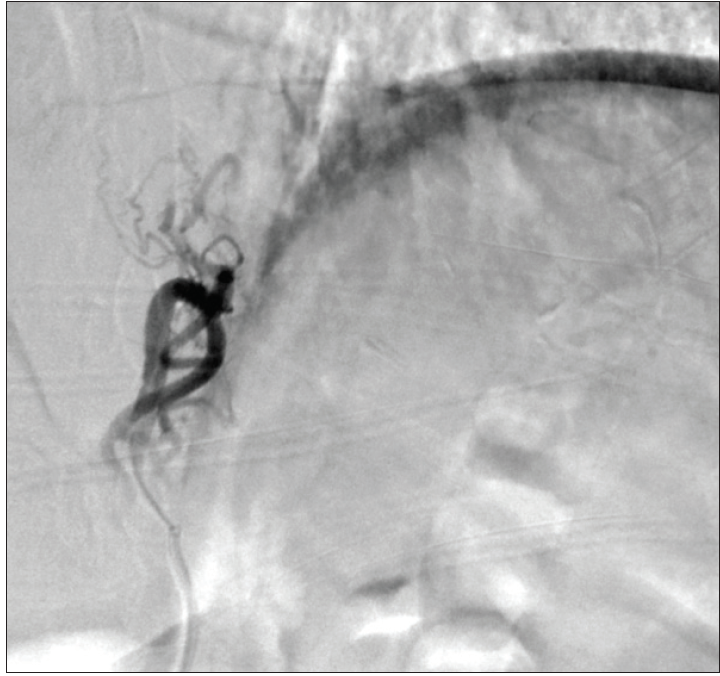 Splenic Artery Embolization: Proximal or Distal? A review of when proximal or distal embolization should be used, optimal technique, and results of studies evaluating outcomes. PCS remains underdiagnosed and undertreated, but recognizing this condition and providing endovascular treatment can benefit women with chronic pelvic pain. cTACE: The Rebirth of Lipiodol? Lipiodol-based cTACE remains the most well-studied transarterial therapy for hepatocellular carcinoma. A UK Perspective: PAE: Is It Ready for Prime Time? A look at the current use of prostate artery embolization for symptomatic benign prostatic hypertrophy and what further dissemination could offer to patients.